Please take a look at a few of our testimonials, and you can find or fill out a client surveys here. 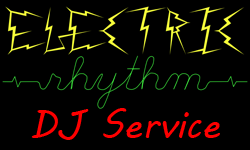 Daryl at Electric Rhythm is very professional and reliable. He was helpful and open to our ideas throughout the planning process. On the day of the event, he was prompt with set up and needed little direction. He certainly went above and beyond to meet our expectations. During the event, he maintained an energetic atmosphere and played the music we requested. Overall, very happy with the service. Would recommend. Daryl was the DJ for our wedding and also ran sound for the whole reception including a few music and dance performances. The whole event went very smoothly, Daryl handled the sound professionally and was very capable. The equipment was setup very well. Daryl played a wide variety of music for the dance which everyone enjoyed. Daryl was able to go with the flow and mix the tracks nicely. The dance was a lot of fun and made for a very memorable evening with family and friends. We would like to express our sincerest thanks to Daryl Twilley for his efforts at our wedding in October of 2010. We write this letter with the highest level of commendation for the level of service we received and we highly recommend Daryl for any of your own Disc Jockey (DJ) or Master of Ceremony (MC) needs. Daryl is well versed with varying his musical offerings at any type of function and is open to requests and suggestions. His musical library is extensive and he prides himself with being able to meet the needs of his clients to help make their events ‘theirs’ when you bear in mind the significance of music in our lives and of course, during special events. Daryl has demonstrated himself to be knowledgeable, friendly, courteous and shows a great deal of professionalism on and off the dance floor or stage. He has also shown that he works well under pressure and can work with deadlines. Aside from being easy to work with, Daryl is also highly skilled with audio and video equipment. To his credit he possesses all the necessary equipment to accommodate almost any function, but he is fluent enough in his profession to make recommendations to his clients regarding the use of other equipment, decorations or even alternate setups. We encourage anyone seeking a highly skilled DJ consider Daryl Twilley and we are certain that if you do meet with him to discuss your event he will surely impress. It is also our understanding that Daryl is fully licensed and is a member of a local DJ association so this also speaks highly of his accreditation. We thank you for taking the time to read this memo and hope that the above information has somewhat illustrated the overwhelming success of our own special event hosted by Daryl Twilley and hope that your own event is just as memorable. My husband and I had Mr. Twilley as our wedding DJ out at camp on September 18th, 2010. He arrived early, set his equipment up quickly and quietly, and parked his truck and trailer well out of the way of the arriving guests. He was there to provide light music over dinner, but when our bagpiper failed to show up for the wedding march, Mr.Twilley very kindly offered to play an appropriate selection of music for the walk down the aisle. He chose a beautiful piece from his collection in no time at all, and serenaded the wedding party to the alter. I am very grateful for his quick thinking and broad selection of music, and I would recommend his services to anyone in the market for a good DJ! He was also very good at keeping the volume to just the right level to allow for conversation over dinner, and was as professional about repacking his equipment at the end of the party as he had been at the beginning. All in all, my husband and I were very pleased with Mr. Twilley’s services!